The top five in the Showman of Showmen Contest. Sarah Lehner, shown with her feeder calf, won the Junior Fair Livestock Showman of Showmen Contest at the Delaware County Fair on Wednesday. 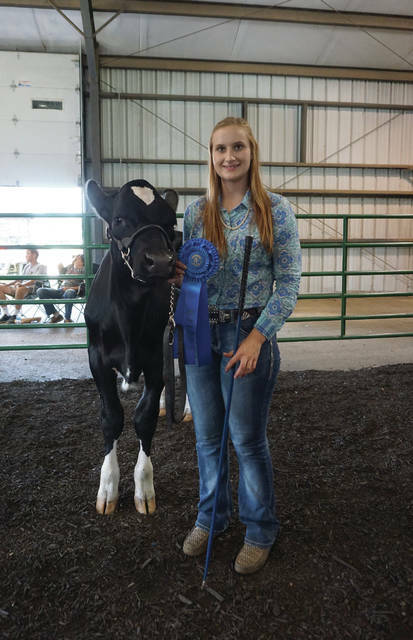 Competing in her final Delaware County Fair event as a Junior Fair exhibitor, Sarah Lehner won the Junior Livestock Showman of Showmen Contest on Wednesday. Lehner, of Delaware, is a Buckeye Valley graduate who is a freshmen attending The Ohio State University at its main campus, majoring in animal science. Her family operates Dee Lehner Farms in Delaware. Lehner said she’s been involved in junior fairs for 10 years at the local, state and national levels. The Showman of Showmen contestants are already winners with their animals, winning their category earlier during their respective class show at the fair. So the idea behind the Showman of Showmen Contest is to show your knowledge and handling of the other classes. Jon Melvin, who runs the Junior Fair Horse Show, was the Western Horse judge (the Western horse uses a halter, the English uses a bridle) for the contest. “We have five questions we ask them for basic knowledge, then have them do real basic showmanship pattern with the horse, see if they got the basics down,” Melvin said. Most of the animals are inside the ring, except for the two horses and the dog. Melvin said the horses were kept out to give the other animals more room. The contestants spent five minutes at each station with an animal and judge, with a one-minute warning given. At the end of the five minutes, they go clockwise to the next animal, starting and ending the contest with their winning animal. They answer five questions from the each judge and handle or lead each animal as instructed by the judge. The contestant gets up to 10 points from the judges, based on correct answers and proper handling. Junior Fair Board members, wearing t-shirts that read, “You say raised in a barn like it’s a bad thing,” run the scores to officials who tally the results. In all, the event takes an hour to 90 minutes. 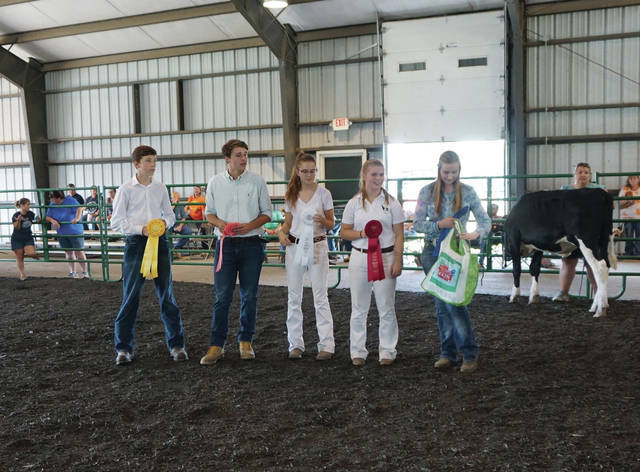 The contestants were Heather Cade (winner of the Dairy Goat class); Donovan DeCoster (Dog); Abby Facemeyer (Beef Cattle); Maura Flanagan (English Horse); Emma Haynes (Western Horse); Lilly Henney (Hog); Emma Hildebrand (Alpaca); Natalie Hohman (Pygmy Goat); Lehner (Feeder Calf); Caleb Meade (Market Goat); Zane Melvin (Market Sheep); Madison Neimeyer (Rabbits); Rachel Sherman (Dairy Cattle) and Cole Wecker (Chickens). Facemeyer, Henney, Meade and Wecker attend Big Walnut High School. Along with a blue ribbon, Lehner won a blanket and a clock. Rounding out the top five were Cade (second), Sherman (third), Meade (fourth) and DeCoster (fifth). Junior Fair Queen Lauren VanGundy, who has shown cattle and hogs, was on hand for the event. https://www.delgazette.com/wp-content/uploads/sites/40/2018/09/web1_Contest-1.jpgThe top five in the Showman of Showmen Contest. https://www.delgazette.com/wp-content/uploads/sites/40/2018/09/web1_Lehner-1.jpgSarah Lehner, shown with her feeder calf, won the Junior Fair Livestock Showman of Showmen Contest at the Delaware County Fair on Wednesday.